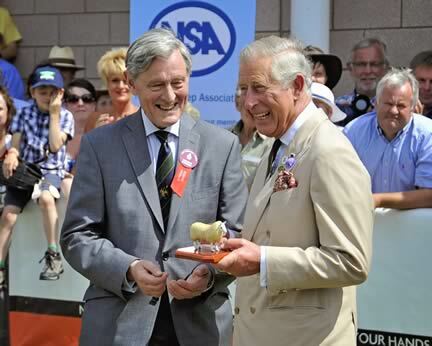 HRH The Prince of Wales’ outstanding contribution to the sheep sector was recognised on Wednesday 24th July when the National Sheep Association (NSA) presented him with the George Hedley Memorial Award in a special ceremony at the Royal Welsh Show. The NSA George Hedley Memorial Award is given annually to recognise an individual for their outstanding contribution to the sheep sector. 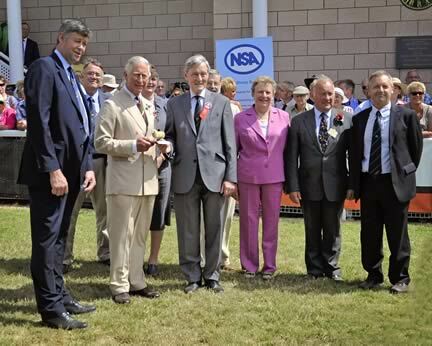 HRH was announced as the 2012 recipient earlier this year and the NSA was delighted he was able to accept his award in such a public setting with so many people in attendance. NSA Chairman John Geldard said: “In its 52-year history the George Hedley Memorial Award has recognised a wealth of great people who have made incredible contributions to the industry, and it is a pleasure to add a member of the royal family to that list for the first time. “Over the last two decades The Prince of Wales has taken an enormous interest in farming, and sheep and the uplands in particular. He has great knowledge and an inspirational vision of agriculture and food production and has drawn attention both to the issue of food security and local supply chains. I have seen His Royal Highness with retailers on the edge of their seats as he gently encourages them to look at local food for the local economy, and make a real difference in some desperate times. The winner of the George Hedley Memorial Award is voted for annually by NSA representatives, following nominations from a number of committees, organisations, breed and show societies involved in the sheep sector. Nominations for the 2013 award will be invited later this year. The NSA has presented the George Hedley Memorial Award annually since 1960. Each person who receives it is given a specially sculptured statuette of a South Country Cheviot sheep, which is mounted on a plinth carrying the name of the recipient and the words ‘For outstanding service to the sheep industry’. Recipients are also made Honorary Life Members of the National Sheep Association. The award is given to honour the memory of George Hedley, a highly respected farmer from the Scottish borders who was involved with the NSA (then the National Sheep Breeders Association) for many years. It was while he was Chairman of NSBA, travelling to a Council meeting in London on 26th January 1960, that he was tragically killed in a car accident.